What do Brad Pitt, Viola Davis, John Goodman and Jessica Chastain have in common? Each of them appears in two of the nine movies nominated for Best Picture of 2011 by the Academy of Motion Picture Arts and Sciences. Four of the films include French settings or characters, three of them use World Wars I or II as plot elements, and two of them feature a boy trying to strengthen ties to his late father by solving the mystery of a missing lock or key. Aside from all that and a pervading air of nostalgia, the field of nominees is most notable for its diversity. Good luck to the Academy trying to sort it all out, because these nine films are nearly incomparable. The Artist may appear to casual moviegoers as the oddball of the bunch. After all, it’s a silent movie shot in black and white. This does not, however, signal pretentiousness. On the contrary, it’s a very accessible, entertaining film that’s bound to charm anyone who gives it a chance. Best Actor nominee Jean Dujardin and Best Supporting Actress nominee Berenice Bejo are magnetically charismatic as falling and rising stars at the dawn of the talkies. Those with a fondness for silent cinema will enjoy the evocation of that era, but it’s not necessary to be a film buff to like The Artist. It’s a lightweight yet engaging romance, a rare crowd-pleaser that does not pander to its audience. Pandering, unfortunately, is the venial sin that corrupts Steven Spielberg’s War Horse. As brilliant as a filmmaker Spielberg is, he apparently cannot resist going for schmaltz. Even the magnificent Schindler’s List was marred by it, as in the over-the-top scene in which Oskar Schindler publicly chastises himself for not having sold his cuff links to finance the rescue of more victims. In War Horse, there is a contrived dramatic moment that is every bit as embarrassing as the hackneyed employment of a slow, solo clap that builds to a roar of applause.You’ll know it when you see it. John Williams’ syrupy score and the simplistic portrayal of hardworking peasant folk bring the narrative dangerously close to the unintentional silliness of Far and Away, but thankfully there is much more to War Horse. Its battle scenes are beautifully executed, and though there was surely plenty of CGI work involved (for how else could it have been done? ), any digital trickery is undetectable. Hats off to Spielberg, then, for a technically dazzling movie that must have been a bear to make. The artistry and high production values almost make up for the schmaltz. One might expect a similarly vulgar manipulation of the heartstrings from Extremely Loud and Incredibly Close, dealing as it does with the plight of a socially challenged boy who seeks to reconnect with the father he lost in the World Trade Center disaster. That his parents are portrayed by Tom Hanks and Sandra Bullock might seem to reinforce that conviction. Yet Extremely Loud and Incredibly Close takes the high road, never exploiting the tragedy but instead employing it metaphorically as a symbol of all the senseless pain that haunts our everyday lives. Thomas Horn gives a wonderful performance as the helplessly inquisitive boy, and Best Supporting Actor nominee Max Von Sydow shines as the one adult to whom the boy can reveal his shame. Also devoid of melancholy is The Descendants. Don’t be fooled by synopses that promise George Clooney as a father struggling to raise his daughters while his wife vegetates in a coma. The film is actually an unsentimental and messy look at familial loyalty and the societal responsibilities that accompany great privilege. Clooney walks a fine line as a weary man who has finally grown up enough to empathize with everyone in his life, including those who have wronged him. While its gorgeous panoramas of Hawaiian landscapes demand to be appreciated on the big screen, The Descendants also manages to portray a darker side of life in the Aloha State. As an adherent to the maxim that life is simultaneously wonderful and terrible, I found its contrast appealing. If such modern angst leads one to yearn for simpler times, Woody Allen’s Midnight in Paris is a funny and thought-provoking antidote. Now in his mid-seventies, Allen can no longer credibly play a young romantic lead role, and so the reins are handed over to Owen Wilson, who channels his director so successfully that one almost expects him to turn a Parisian corner and bump into Annie Hall. What is new, however, is a sobering acknowledgement that nostalgia is an illusion, a seductive phantasm that can inhibit our one and only chance to enjoy the present. It’s a cleverly made point with fun performances along the way. As usual, Allen milks plenty of laughs from the pomposity of artists and critics alike. And speaking of art, what would the Best Picture nominations be without the inclusion of at least one film that is sure to rattle the popcorn bags of Joe and Jane Average? Apparently there were theater managers who found it necessary to post warning signs to potential patrons of The Tree of Life, noting that the movie features a non-linear narrative that may not appeal to a broad audience. This gave the managers an excuse when disgruntled customers asked for a refund after the first thirty minutes. That’s what you get for casting Brad Pitt in an art house movie. Not since Stanley Kubrick’s 2001 have audiences been served such a demanding departure from storytelling as we know it. One sequence in particular seems designed to test the limits of a viewer’s patience. Yet there are many good things to be said about The Tree of Life, most notably the performance of Hunter McCracken as the eldest son of a troubled father. The way in which director Terrence Malick replicates the recollection of childhood memories is compelling. It is a visually and aurally dynamic film. It may be a movie that requires multiple viewings to be appreciated, though few moviegoers may be interested in sitting through it more than once. Then there’s The Other Brad Pitt Film, also known as Moneyball. An avid interest in baseball may enhance your enjoyment of the movie, but only remedial knowledge is required. On the surface, it is an account of how general manager Billy Beane overcame the dismal personnel budget of the Oakland A’s to create a team that rivaled the most expensive franchises in Major League Baseball. Take a step back, however, and the true genius and universal appeal of Moneyball is revealed. It’s really a film about how conventional wisdom can become institutionalized in any organization, how creative thinking is often discouraged, and how quickly the status quo can turn upside-down when someone dares to try things differently. Best Supporting Actor nominee Jonah Hill steals the show as Beane’s cerebral assistant and proponent of an unconventional approach to building a winning team. Rounding out the Best Picture nominations is Hugo, a rare case of a movie that is better than the book upon which it is based. Brian Selznick’s The Invention of Hugo Cabret won the 2008 Caldecott Medal despite the fact that it is as much a novel as it is a picture book. It is graphically arresting, practically a ready-made set of storyboards, though the plot structure is somewhat transparent and contrived. Martin Scorsese transcends the limitations of the printed page by fleshing out the characters and presenting actual clips of what the book could only suggest: the unique footage of early silent cinema. Hugo also exploits its 3D format to maximum effect, no surprise given that the title character lives atop a clock tower at a train station. The result is a homage to cinematic illusion that surely would have pleased pioneering filmmaker Georges Melies, whose A Trip to the Moon (1902) and interest in automatons figure prominently. Which film will win? Which film should win? I wouldn’t lay out my gambling money on this race. 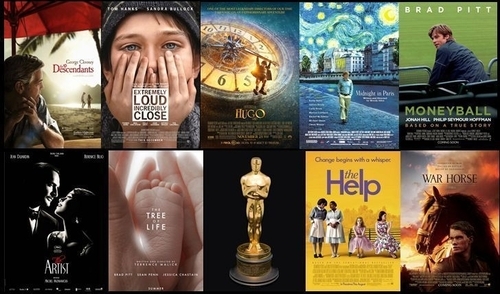 There’s only one safe bet: the 2011 Best Picture will be a movie worth watching. 1 comment on "Best Picture"
Bob, solid reviews and great artistic insight.